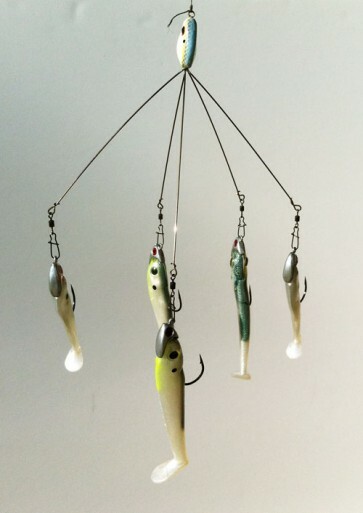 To legally use the Alabama Rig in California inland waters, the rig must be attached to one rod with one line and no more than three of the attached lures containing hooks. In California, “all fish may be taken only by angling with one closely attended rod and line or one hand line with not more than three hooks nor more than three artificial lures (each lure may have three hooks attached) thereto” (California Code of Regulations, section 2.00). What to do with prohibited aquarium sharks? Answer: Unfortunately, permits are not available to possess species listed in CCR Title 14, section 671 (Importation, Transportation and Possession of Live Restricted Animals) for hobby (pet) purposes. To stay within the law, the only options are: (1) transfer the animal to another appropriately permitted facility, (2) transfer the animal out of the state, or (3) humanely destroy it (CCR Title 14, section 671.5). Handgun with a flashlight/laser-lite combo? Answer: Yes, it is legal as long as the handgun is not used to assist in the taking of big game. Can a rifle hunter and an archery-only hunter hunt together? Answer: The restriction only applies to archers who are taking deer during the archery season and in areas where the AO tag can legally be used. As long as your individual method of take (firearm or archery) matches the tag you carry, you can legally hunt together. However, if you choose to hunt in close proximity to your friend and are contacted by a game warden, you can expect that you will be asked several questions to ensure that the special privileges granted to AO tag holders is not being compromised.